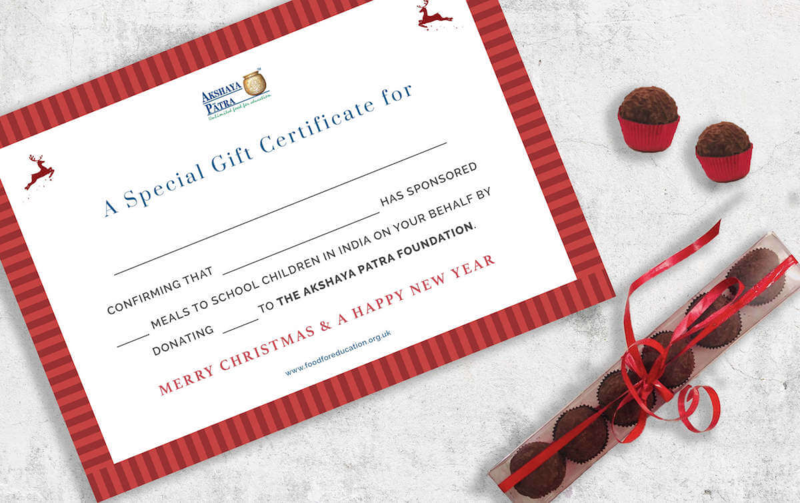 This Christmas send a gift certificate to your near and dear ones which shows that you have donated to Akshaya Patra on their behalf, and the money will be used to provide school meals for the underprivileged children. Christmas is just around the corner and the spirit of the season is in the air. This also means we are all scampering for different and unique Christmas gifts for our near and dear ones. So here is a gift idea we know is just so apt for this season of giving. Why not send a gift certificate to all of them which shows that you have donated to Akshaya Patra on their behalf, and the money will be used to provide school meals for the underprivileged children. Let them know that rather than sending them a gift which could simply find a place in one of their cupboards, you have chosen instead to bring them blessings from the children who receive school meals from them. On your behalf, we will send them a personalised certificate with the number of school meals they have sponsored and a delightful box of handcrafted eggless truffles. All you need to do is – let us know the number of family and friends you would like to send a gift to, along with your chosen amount and we will do the rest. Show your love to your friends, family and colleagues just a bit differently this year. Surely this is one Christmas legacy you would love to be a part of! Simply send us the names of the people you want to gift, and the amount you wish to donate on behalf of each of them. We accordingly prepare a gift certificate with their name, add the chocolates and post it directly to them on your behalf. Or you can choose to get it sent to you, so you can gift it to them personally. We also have Corporate gift options starting from £35. This includes the relevant gift certificate with options of boxes with 9, 16 or 25 pieces of truffles. Minimum order of 6 boxes required. Please contact us on 02074226638 for further details on this. To place orders email us on office@akshayapatra.co.uk or speak to one of us on 02074226612/38. The artisan chocolates have been made by Amrta (www.amrtachocolates.com). All chocolates are eggless and freshly prepared by Ambika, founder of Amrta, herself! Here’s to a very Merry Christmas and a wonderful new year!